The Schrade SCALY is small knife that has received a large amount of attention. There is a lot of interest in a discrete, legal, automatic knife and the Schrade SCALY claims to be just that. Below is my review of the knife. The Schrade Scaly is a small knife that can be converted into a California Legal automatic knife (which Schrade hints at by referring to the SCALY as a “California Issue Pocket Knife”). In order to meet the CA legal automatic knife requirement the blade must be less than 2″ long. The blade on this knife is 1.7″ and made of 440C stainless steel. This is a sharp little leaf shaped blade with a fat flat grind. Really I don’t think you could do a ton of damage with this knife but it could be handy as an EDC item or a backup knife tucked into your boot or something. The handle of this knife is 3.1″ long and is made of lightweight T6061 aircraft aluminum with yellow delrin scales. 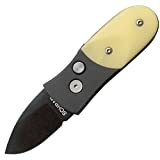 At 2.1 ounces this is a very lightweight knife that you could easily forget you are carrying. I would have liked to see a lanyard hole on this knife as I think this could make for a decent keychain. I get a lot of emails about the automatic nature of the knife as retailers can be somewhat misleading. The Schrade SCALY is often advertised as an California Legal “automatic” or “spring assisted” knife, and indeed with it’s less than 2″ long blade, this knife is capable of becoming a “California Legal Automatic Knife” with the addition of a spring. However, out of the box this knife is not an automatic knife because it doesn’t have a spring. I’ve heard that you can find springs for this little knife on ebay, open it up and the spring drops right in. Please note that I haven’t tried this personally. The SCALY is a popular automatic conversion because it has a lock on the top of the knife. This prevents the knife from accidentally opening. This is a great feature that is becoming harder and harder to find because apparently BenchMade is claiming that they own rights to all automatic knives with safety locks. Benchmade is currently in the middle of a lawsuit over the locks claiming the lock is covered in their patent (Benchmade v. Roadsideimports if you want to do some reading). Perhaps the lawsuit is why the SCALY does not have a spring – Schrade may have pulled them to get around the lawsuit. At any rate, if Benchmade does win the lawsuit, you may not have access to this feature on Schrade assisted open (or assisted capable) knives so if you want a SCALY or any similar Schrade knife, my advice would be to buy it now. I own the Schrade Scaly and it does NOT have a spring, but it IS a Push Button super-fast open and lock knife. It has a very satisfyingly loud lock. I wanted to buy more, but now I am concerned that it has been changed into a regular pocket knife. It would not impress anyone if that is true. Thanks for the comment, Lora. Yeah most of these do not ship with springs, but if you hunt around they can be bought separately. My guess is the knives are still automatic capable (seeing how that was the point of the knife) but you could always contact Taylor Cutlery directly.